New types of legal, easily available recreational drugs are putting unsuspecting users at risk of physical harm and even death. No clandestine meetings with drug dealers, no stealing prescription medications from family members—teens and young adults can walk into a convenience store or “head shop” and leave with a legally purchased synthetic drug for less than $50. Also readily available for Internet purchase, synthetic drugs represent a dangerous trend in substance abuse. Despite recent temporary bans of selected ingredients by the U.S. Drug Enforcement Administration (DEA), many synthetic drugs remain legal due to the hundreds of formulations in existence. And, because they are often legal, synthetic drugs may not be perceived as dangerous. However, government and public health agencies, as well as medical professionals and substance abuse counselors, have launched efforts to raise awareness of the real danger of these substances due to a rapid growth in use and associated adverse side effects. Emergency department visits for serious and sometimes-fatal side effects have increased significantly in the last two years (Jerry, Collins, & Streem, 2012). According to the American Association of Poison Control Centers (AAPCC), overall calls related to synthetic drugs quadrupled from 2010 to 2011; calls relating to synthetic bath salts increased by more than 20 times. Although synthetic drug users do include adults over the age of 30, 60% of cases involve individuals aged 25 and younger, according to the AAPCC. Recent studies also indicate that synthetic drugs are emerging drugs of abuse for college students and young military personnel (Bebarta, Ramirez, & Varney, 2012; Hu, Primack, Barnett, & Cook, 2011). The Student Assistance Program (SAP) at Caron Treatment Centers in Wernersville, PA, a substance abuse treatment facility that provides community outreach services, has seen an increase in the number of adolescents using synthetic drugs. Synthetic marijuana is now the second most commonly abused illicit drug among high school seniors, says Cory A. Trevena, MA, SAP coordinator at Caron. The rapid rise in popularity is attributed to Internet accessibility and information. According to Tom Hedrick, a founder of The Partnership at Drugfree.org, the Internet has not only made it easier to acquire synthetic drugs, but some websites also hype the synthetic high and provide direction for new users. “Synthetic drug users share their highs and other experiences online, and these websites then allow an accelerated learning curve related to synthetic drug use, a ‘how-to guide’ for teens and young adults,” Hedrick says. The two most commonly used synthetic drugs are bath salts and incense (see sidebar). But despite their names and physical resemblance, these products are not the scented crystals purchased for soaking in a hot bath or the powder burned for aromatherapy or meditation. Synthetic drugs are named as such and labeled as “not for human consumption” only to avoid FDA regulation and mislead parents and authorities. “These substances are legal simply because of a clever marketing ploy, not because they aren’t dangerous,” says Jason Jerry, MD, a staff physician at the Cleveland Clinic’s Alcohol and Drug Recovery Center. He and his colleagues have seen a notable increase over the past year in the number of emergency department cases involving synthetic drugs. “Common presentations include psychotic reactions involving extreme paranoid delusions, agitation, anxiety, heart palpitations, and sweating. Deaths have occurred related to cardiac events, seizures, and hyperthermia,” Jerry explains. He has also recently seen a severe skin infection related to bath salt injection. Published studies and media stories have also reported multiorgan failure and deaths due to misdiagnosis—for instance, one patient presenting with extreme hyperthermia was initially diagnosed and treated for viral meningitis (Fass, Fass, & Garcia, 2012; Borek, & Holstege, 2012). Other especially troubling side effects are a lack of pain response and lack of judgment, which can result in dangerous behaviors and injury to the user and others, Hedrick says. Numerous news stories report synthetic drug users who have been severely injured or died after running into traffic, shooting themselves, or falling due to an altered state of mind. Severe side effects are difficult to treat due to the wide variability of synthetic drug formulations, their biochemical properties, and their presentation as psychiatric disorders or other medical conditions. “Several pharmacologically active chemicals have been marketed as bath salts or incense, and there is no way to know from one brand to the next what is actually contained in them,” Jerry says. In addition, synthetic drugs may be formulated with other substances, such as herbs, including natural marijuana, and then consumed by the user along with prescription medications, alcohol, and illegal drugs, which further increases their danger, according to Hedrick. “Synthetic drugs are especially problematic for those who already have addiction issues and/or other mental health conditions,” Hedrick says. Interactions with other drugs—whether prescribed or illegal—make side effects more serious and difficult to treat. “It’s difficult to sort out the medical and psychological impact of synthetic drugs when they are mixed with other drugs and alcohol,” he adds. Synthetic marijuana has very different effects than natural marijuana, and users may be misled into thinking they will achieve a similar state of relaxation or euphoria. “Synthetic cannabinoids clearly seem to be sending more people to emergency departments around the country than natural marijuana,” Jerry notes. Psychotic symptoms are more likely with synthetic marijuana products because they do not contain cannabidiol, the chemical in natural marijuana linked to sedative, anxiety-relieving, and antipsychotic properties. “Synthetic cannabinoids are what we call full agonists, that is, they bind to cannabinoid receptors in the brain and stimulate them 100%. This action is in contrast to THC, the main active ingredient in natural marijuana, which is a partial agonist and only partially stimulates the brain’s cannabinoid receptors,” Jerry explains. Therefore, the synthetic versions have real overdose potential, whereas the THC in natural marijuana reaches a dose plateau, with a corresponding lower potential for overdose. “The known effects of synthetic drugs are so serious that parents, teens, and young adults need to know that these are not at all safe to use despite being legal and easily obtained,” Hedrick emphasizes. The unknowns regarding synthetic drugs are even more troubling. According to Jerry, because ingredients were synthesized for research on lab animals, little is known regarding their effects on humans. And the pharmacologic action and other harmful effects of burning synthetic cannabinoids when smoking are also unknown. “No good science exists on the long-term impact of synthetic drugs on the developing adolescent brain,” Hedrick notes. Synthetic bath salt users may initially try them for a recreational high but, as with most drugs, the potential for addiction likely exists despite a current lack of data. Given the many unknowns, prevention efforts aimed at susceptible teens and young adults have been launched by the medical, social services, and law enforcement fields. 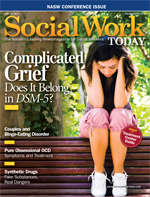 Social workers can play a key role in synthetic drug use prevention and awareness efforts. Jim Ryan, an Ohio certified prevention specialist II and consultant/trainer in alcohol, tobacco, and other drug abuse prevention, advises social workers to take an intensive and comprehensive prevention approach with clients at higher risk of using synthetic drugs or those already doing so. Ryan currently provides training to social workers and social work students at Ohio State University and other social services organizations. One of his recent training courses educated social workers on synthetic drug use trends, including information on community sources of synthetic drugs, signs and symptoms of use, and legal issues surrounding possession and use. “From a prevention standpoint, it’s important to recognize that drug use in teens is not likely to begin with synthetics but with alcohol or natural marijuana. Taking a strong stance against underage drinking and smoking marijuana is an essential first step,” Ryan says. As part of substance abuse counseling and education, social workers should learn and communicate the medical dangers of abusing synthetic drugs, including the serious negative effects on the brain and heart and the potential for dying. It also would be worthwhile to explain that possessing the synthetic drugs that are illegal may lead to imprisonment, says Jennifer (Fass) Gershman, PharmD, CPh, a clinical assistant professor at Nova Southeastern University College of Pharmacy and coauthor of a recent review of the legal status and abuse patterns of synthetic bath salts. To help identify suspected users, she recommends learning the street names for synthetic drugs and the symptoms common with their use along with being able to identify them when making a home visit. Social workers can contact local pharmacists who evaluate patients for illegal drug use in community and hospital settings to act as an educational resource regarding synthetic drugs and their adverse effects, she adds. But social workers need to walk a fine line between encouraging prevention vs. inadvertently encouraging use, Ryan warns. For example, using street names of synthetic drugs when communicating with teens may seem like a “cool” way to initiate a relationship but may actually lead teens to become more comfortable with the terminology and therefore the drugs, thereby increasing the likelihood of use. Scare tactics, such as saying, “If you use bath salts, you’ll die!” may backfire and diminish social worker credibility if teens have friends who have used them without serious consequences. Thrill-seeking teens may also take such statements as a challenge. Education about synthetic drugs should focus not only on the harmful effects but also on positive reasons to be drug free, such as staying healthy and having good self-esteem, and helping teens and young adults develop a plan for coping with situations where drug use may occur, Ryan suggests. Providing parents with detailed information about the drugs (e.g., descriptions of the drugs and associated paraphernalia, street names, accessibility) as well as basic prevention strategies can increase parental awareness and influence, Ryan says. Because they are so involved in substance abuse counseling, social workers can make a big impact with parents and local community members, for whom synthetic drugs are likely a new phenomenon, Hedrick adds. Caron Treatment Centers recently launched a Parenting for Prevention program, reaching more than 1,300 parents in the area surrounding the treatment center. In local schools, psychologists and social workers offer psycho-educational support groups for students that discuss the risks and side effects of synthetic drugs and an educational program for school faculty that provides detailed information on current drugs of abuse. “We believe that education—to parents, community members, and school staff as well as students—regarding the very real risks and dangers that occur following synthetic drug use is the key to prevention and intervention,” Trevena says. At The Partnership for Drugfree.org, social workers who are certified substance abuse counselors staff a parents’ helpline. Currently, they are working on increasing parental awareness regarding synthetic drug use and building an online support community. Hedrick hopes these efforts will result in parents realizing the dangers of synthetic drug use, which are often underestimated due to their legal status and widespread availability. Currently, eight chemical components of synthetic bath salts and marijuana are temporarily banned by the DEA (see sidebar). “Studies and case reports indicate that synthetic bath salts are highly abused. All synthetic bath salts substances should be permanently banned,” Gershman says. However, temporary bans have not deterred synthetic drug makers and users. “Quicker than states and the DEA can classify them as illegal, synthetic drug users find ways to change the ingredients so they remain legal. Law enforcement is constantly playing catch up with synthetic drug chemists,” Hedrick says. There are hundreds of variations for formulating synthetic drugs, and altered chemical components allows their continued legal sales even after a DEA ban (Jerry et al; Fass et al). “Don’t be lulled into thinking the synthetic drug dangers are gone with the recent government bans,” Jerry cautions. The newness of synthetic drugs and their chemical variability means they generally cannot be detected by routine drug screening. Major toxicology laboratories may be able to test for some synthetic drug components, and it has been reported that approximately one-third of samples from juveniles on probation tested positive for two synthetic cannabinoids (Jerry et al). At this time, most testing laboratories can’t test for synthetics. However, by the end of this year, drug tests that detect synthetic drugs are expected to become more widely available, Hedrick says. “The original attraction of synthetic bath salts and marijuana was that they do not show up in drug screening. These are now the drug of choice for those required to undergo regular drug urinalysis testing,” Hedrick explains. Unfortunately, the trend of synthetic drug use will continue, Ryan indicates. “With the growing chemical skills and experience and available Internet resources, expect to see synthetic drugs garnering attention for the foreseeable future,” he says. — Jennifer Van Pelt is a Reading, PA-based freelance writer and a frequent contributor to Social Work Today. Synthetic drugs are manufactured to pharmacologically resemble naturally occurring drugs. The most common ingredients in synthetic bath salts are 3,4-methylenedioxypyrovalerone (MDPV) and 4-methylmethcathinone (mephedrone). MDPV is a dopamine and norepinephrine reuptake inhibitor with no approved medical use. Mephedrone is a derivative of phenethylamine that increases serotonin, norephinephrine, and dopamine and is similar to cathinone, which is similar to some amphetamines. Both MDPV and mephedrone are powerful psychoactive stimulants, and their effects are similar to methamphetamines and Ecstasy. Synthetic bath salts are consumed orally or snorted; recently, some users have tried injecting bath salt solutions. Street names include Blue Silk, Ivory Wave, Stardust, Vanilla Sky, and White Lightning. In October 2011, the U.S. Drug Enforcement Administration (DEA) temporarily placed mephedrone, MDPV, and methylone, another synthetic stimulant, on the Schedule I Controlled Substances list, meaning they are banned and have no medical use. Synthetic cannabinoids (“marijuana”) are being researched as a potential treatment for epilepsy, Parkinson’s disease, and Huntington’s disease. Herbal incense blends were initially thought to be safe, legal, all-natural alternatives to achieve a high similar to marijuana. However, in late 2008, synthetic cannabinoids were identified in these products. Unlike marijuana, synthetic cannabinoids are not derived from the Cannabis plant; rather, they are formulated in a laboratory and specifically designed to stimulate the brain’s cannabinoid receptors. Synthetic cannabinoids are sprayed on herbal blends, making them more concentrated and potent. Synthetic marijuana products are generally smoked. Street names include incense, K2, Spice, Mr. Smiley, and Blaze. In March 2011, the DEA temporarily placed five synthetic cannabinoids on the Schedule I Controlled Substances list. The effects of these synthetic drugs may range from a few hours to more than eight hours. Bebarta, V. S., Ramirez, S., Varney, S. M. (2012). Spice: A new “legal” herbal mixture abused by young active duty military personnel. Substance Abuse, 33(2), 191-194. Borek, H. A., & Holstege, C. P. (2012). Hyperthermia and multiorgan failure after abuse of “bath salts” containing 3,4-methylenedioxypyrovalerone. Annals of Emergency Medicine, Epub ahead of print. Fass, J. A., Fass, A. D., Garcia, A. S. (2012). Synthetic cathinones (bath salts): Legal status and patterns of abuse. Annals of Pharmacotherapy, 46(3), 436-441. Hu, X., Primack, B., Barnett, T., Cook, R. (2011). College students and use of K2: An emerging drug of abuse in young persons. Substance Abuse Treatment, Prevention, and Policy, 6, 16. Jerry, J., Collins, G., Streem, D. (2012). Synthetic legal intoxicating drugs: The emerging ‘incense’ and ‘bath salt’ phenomenon. Cleveland Clinic Journal of Medicine, 79(4), 258-264.